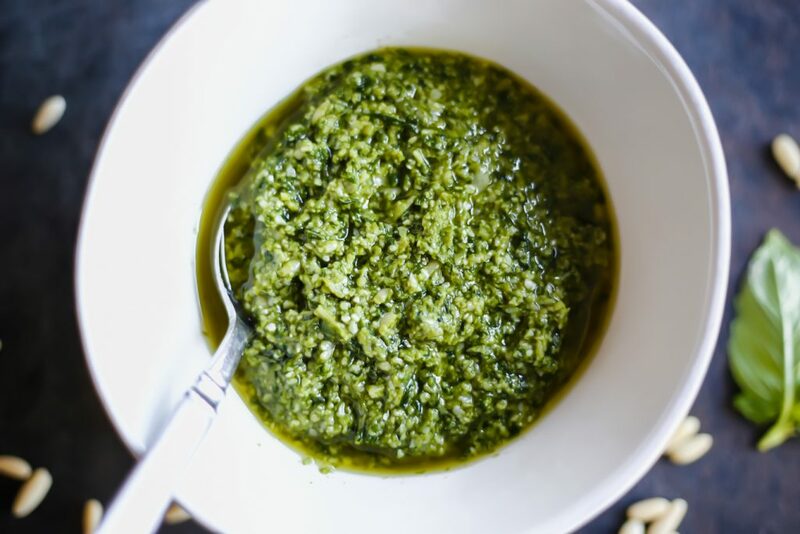 To back up, I’ve been making pesto my whole life. 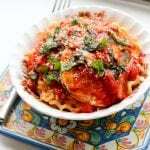 My mom usually had basil growing on our back porch, and we would make big batches at a time whenever there was enough to pick. But we always made it in a food processor. Why wouldn’t we?! It worked great! There are two keys to this method. The first? 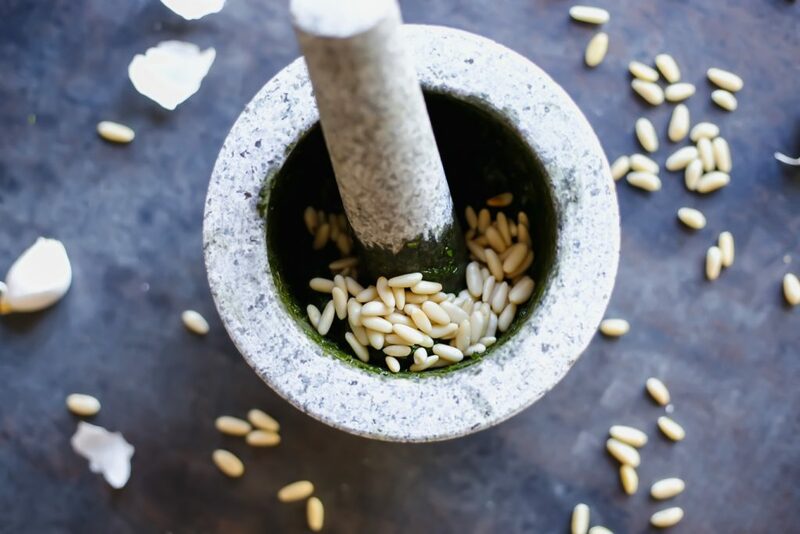 Get a stone mortar and pestle. Afterwards, I tried to recreate what I did at Eataly with a wooden pestle, and it didn’t work. It was so hard to break down all of the ingredients and create the silky sauce we all love. The second key is in the order that you add the ingredients. Garlic has to be first. I minced mine to help make it a little easier – but regardless, you want to smash the garlic with a little salt until it becomes a paste. You won’t get any bites of garlic this way. 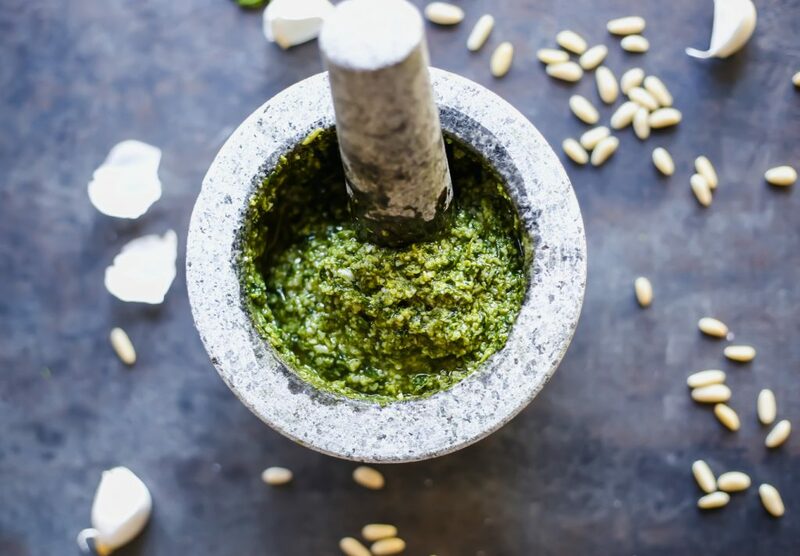 Instead, garlic flavor will be evenly distributed throughout the pesto. Then it’s time for the star: BASIL! 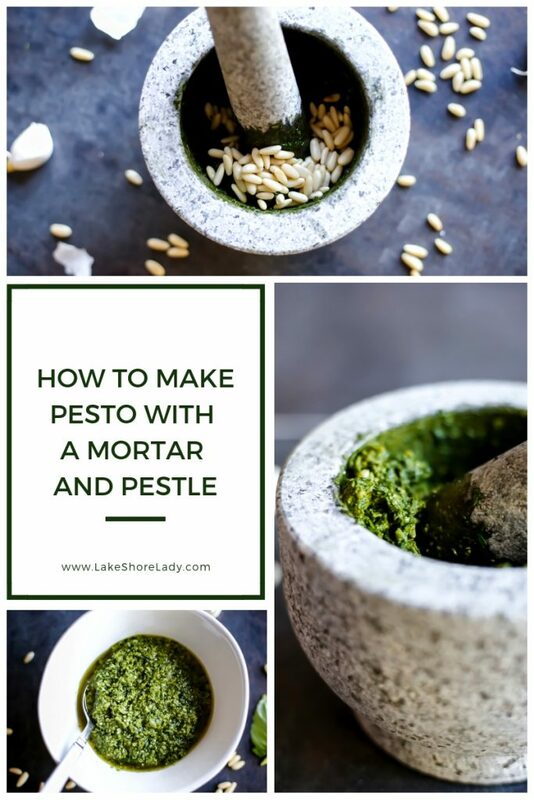 Again, I roughly chopped the pesto to help myself out – because it’s a workout breaking down those leaves! You’ll want to add a little at a time so it’s easier to break down. I also add the parsley during this stage, too. Next up is pine nuts! 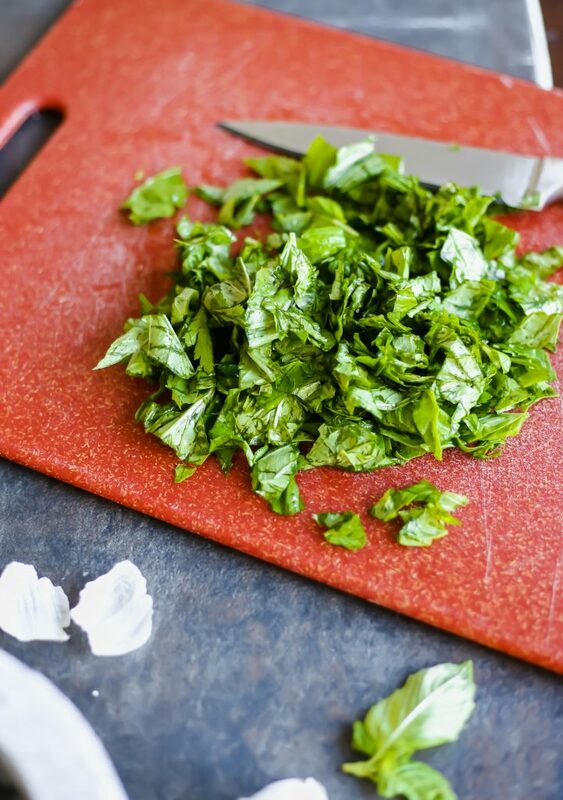 Surprisingly enough, this is where the pesto starts to get thick and creamy. Also, feel free to toast your pine nuts if you like that flavor better! 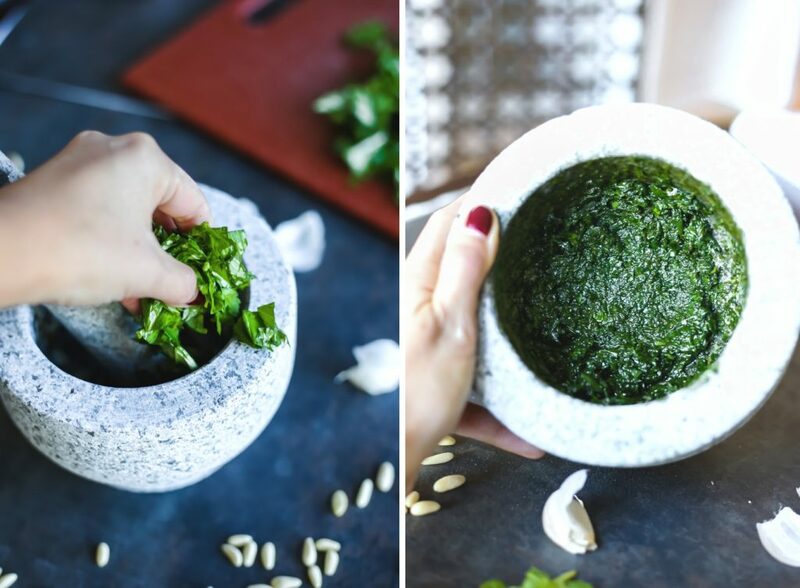 And of course, no pesto is complete without cheese! 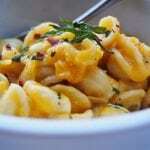 I use both Pecorino Romano and Parmigiano Reggiano in mine. I think the combo is key! Last but not least, add in the olive oil. I actually think I used a little too much to this batch, so I’d recommend adding it little by little until the sauce is the consistency you like. Serve over pasta, or on pizza, sandwiches, crostini – anything! I also freeze any leftovers with the date on the container. You’ll thank me when you can’t find basil in the middle of winter! 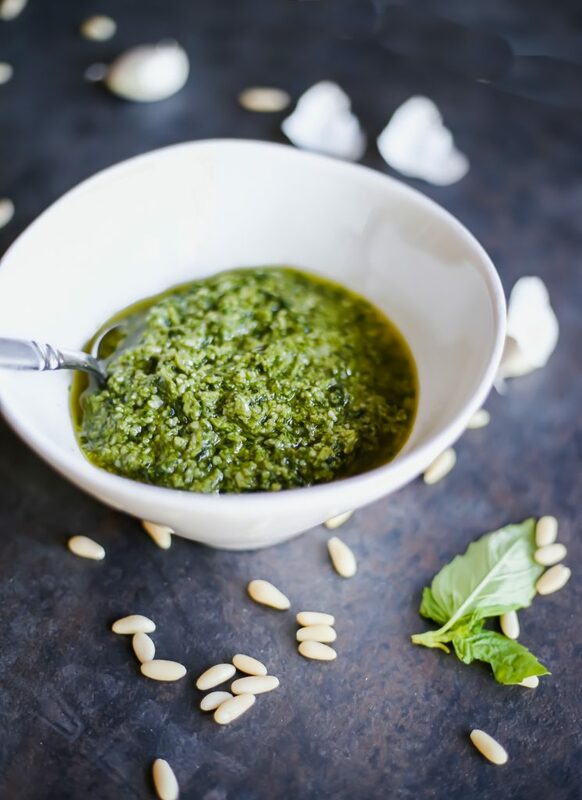 Do you make homemade pesto? What do you put in yours? 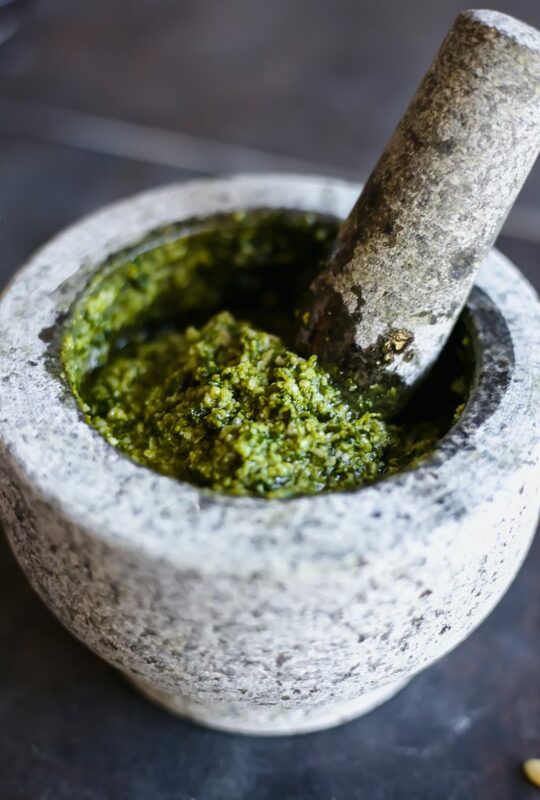 Have you ever made mortar and pestle pesto? 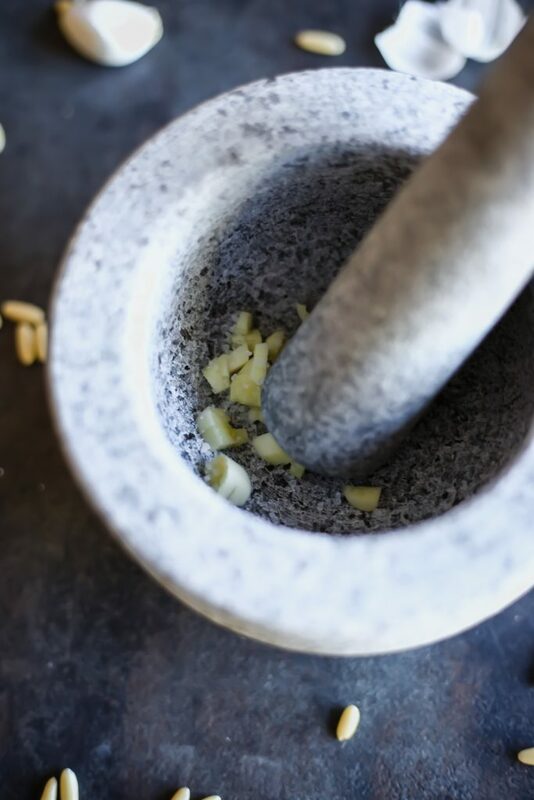 Roughly chop garlic clove and add to the mortar and pestle. Sprinkle with salt and mash the garlic until it becomes a paste. 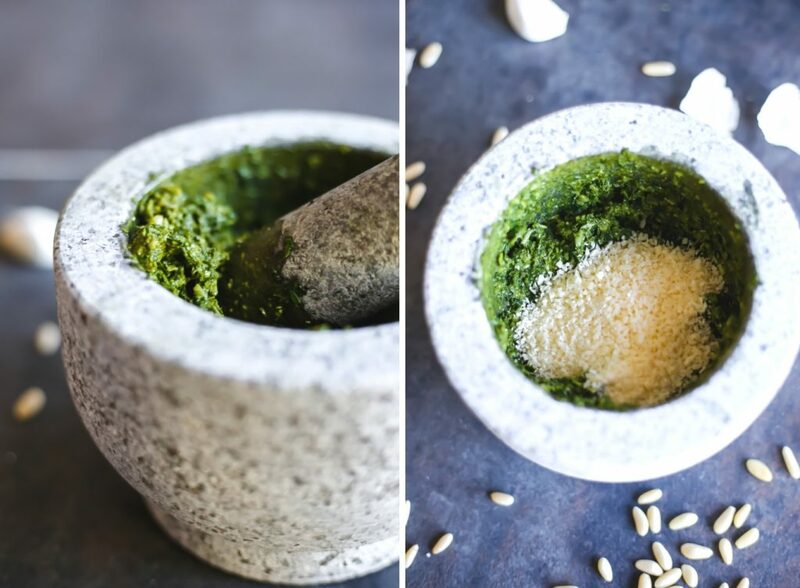 Roughly chop basil and parsley and add in small batches to the mortar and pestle. Once each batch is broken down, add a little more. Continue until all of the leaves are broken down. 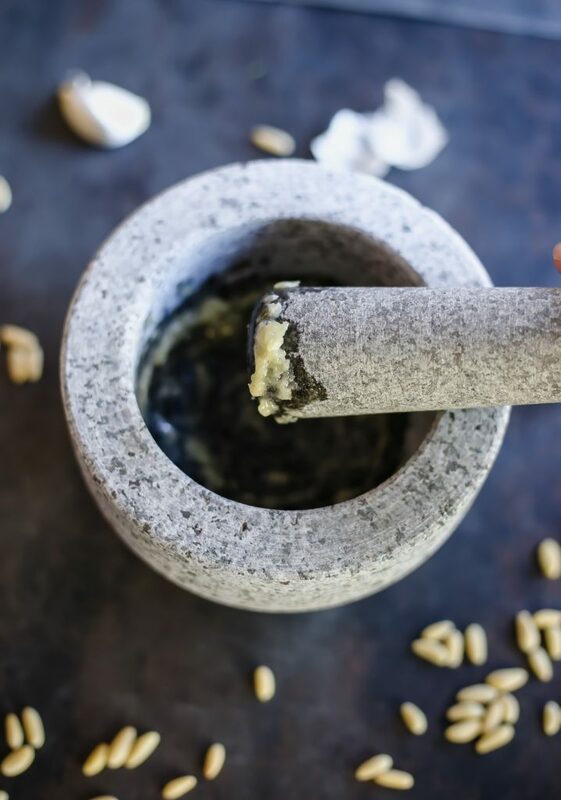 Add pine nuts and continue to grind the mixture together. Add romano cheese and mix until it's incorporated into the other ingredients. Add half of your olive oil and combine. Add parmesan cheese and grind the mixture together. Add more of your remaining oil until the sauce is the consistency you like. 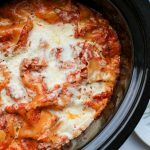 Serve immediately or freeze for a later time! PS. 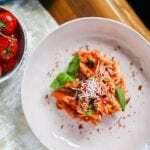 You might also like A Simple Pomodoro Sauce, Healthy Tomato Soup, and Mama’s Easy Lemon Chicken.